A new era in Raiders football began yesterday. Prior to yesterday’s 34-24 win over the Jets, every step forward has had a parallel step backwards. The hopes of putting the past decade behind them was put on hold with every missed kick, every fumbled snap, every broken tackle. I, for one, was afraid to get my hopes up having been so thoroughly inept for such a long period of time. Down 17-7 in the 2nd quarter, Darren McFadden took a handoff from Jason Campbell, took it wide, and turned the corner. And with it, so did the Raiders. The run only made the score 17-14. The Raiders still trailed a playoff caliber by 3 points in the 2nd quarter, but the proverbial light bulb went on. You may beat a Rex Ryan football team, but you don’t beat up one. And that’s what the Raiders were doing, on both sides of the ball. 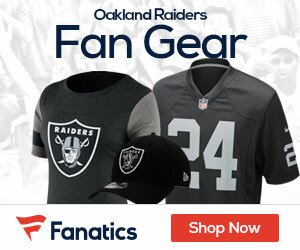 After a Sebastian Janikowski 54-yard field goal tied the game at the half, the front four of the Raiders on the defensive line showed their might. They sacked Mark Sanchez three times in the 3rd quarter, manhandling the Jets offensive line and setting the tone for the final 20 minutes of play. Tied at 17, Head Coach Hue Jackson went to the index of his playbook and came up with two beauties. A halfback option pass from McFadden that turned into a 27-yard run, followed up by a reverse by Denarius Moore catapulted to the end zone by a Samson Satele block on # 36 Jim Leonhard who now wears half that number after being decimated by the Raiders center. 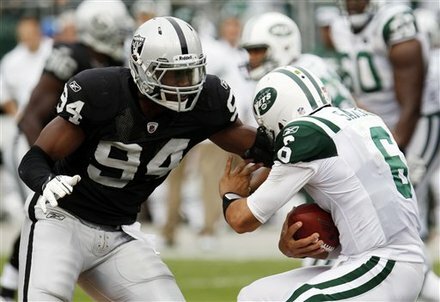 On the next kickoff, Antonio Cromartie fumbled, and the Raiders recovered. Two plays later it was 31-17 Oakland two seconds into the 4th quarter. Still plenty of time for the Raiders to lose. Not this time. Not this team. Their defense stepped up. They kept running the ball—234 yards total—and they didn’t make any mistakes. In the end, it added up to a 10 point win. But it was more than that. It was a statement. A statement that says we’re a team to reckon with. Up next, Tom Brady and the Patriots. We might have a new statement soon. Rookie sensation Moore is something special and who knows what to expect when the offensive unit is completely healthy and Pryor come’s out suspension maybe some fascinating trick plays.